Biography & Genealogy: James Henry Lane, Class of 1854: Genealogy: Born- July 28, 1833, in Mathews Court House, Va. Father- William Gardner Lane; Mother- Mary Ann Henry Lane. Pat. Grandfather- William Lane; Pat. Grandmother- Maria Fulwell; Widow Keeble. Mat. Grandfather- Thomas Barkwell; Mat. Grandmother- Elizabeth Wells. Married- Charlotte Randolph Meade; 1st child- Lidie Hardwell Lane; 2nd- Mary Lane Petrie; 3rd- Kate Neade Lane; 4th- Lottie Lane Sloan. 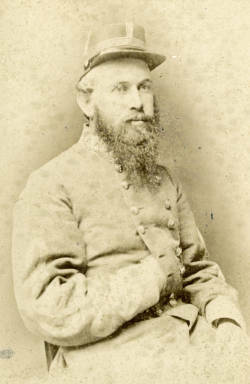 Military Record- Brigadier General, Confederate Army. Career: Engineer, Professor, Principal. Died- Sept. 21, 1907, in Auburn, Al. See "web resource" link for biographical information.